Congratulations to Waltzingmouse Stamps Sketch Challenge as they celebrate their 100th challenge! They are having some special prizes in honor of this milestone. If you haven't already entered, you can find out the challenge details and prizes available using the above link. I decided to use my "Santa Was Here" set for the challenge. I thought that the little reindeer in the dp would be the perfect complement to Santa and his sleigh in the image. Stamps: Waltzingmouse Stamps "Santa Was Here"
Papers: White, pink, dps from Basic Grey "Eskimo Kisses"
LOVELY Christmas card and BEAUTIFUL take on the sketch! Love the papers youve used too! 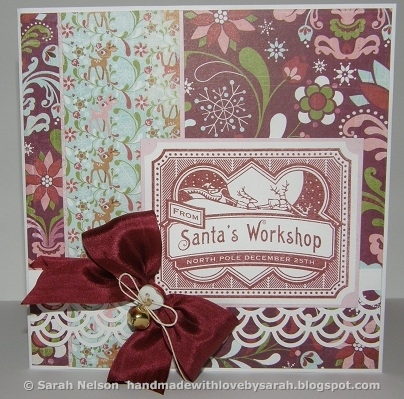 Oh Sarah - I love that stamp - I don't think I've seen it before and now it is one I really must have! Your card is so pretty with the satin bow and the tiny jingle bell - you're really going to make someone's day with this one! 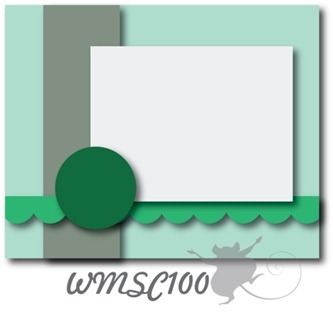 cute stamp and like the bow with button and bell!